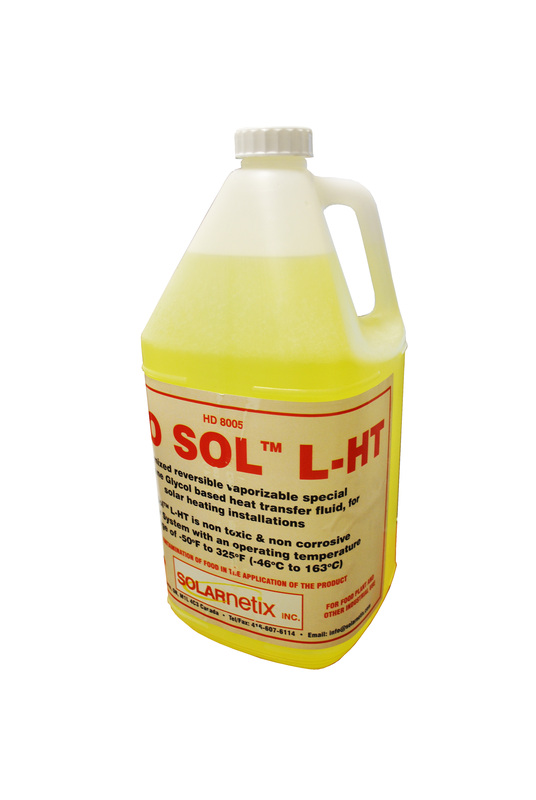 Special High Temp Solar Heating Fluid for vacuum tube solar installations. Propylene Glycol 5 Gallons. Premixed reversibly vaporizable special Propylene Glycol-based Heat Transfer Fluid, for solar heating installations. Modern-day Thermal Solar combo-systems for DHW and space heating are subject of overheating and stagnation because of low heat demand in summer time. Continuing design improvements of solar collectors sig­nificantly change the requirements to the heat transfer fluids regarding its ability to take thermal stress. However, stagnation temperatures of up to 400ºF (204°C) in flat plate collectors still can be handled by traditionally inhibited solar fluids. In contrast to this, vacuum tube collector temperatures of up to 550ºF (287°C) as reached in vacuum tube collectors require the use of a more ad­vanced fluid containing reversibly vaporizable cor­rosion inhibitors. 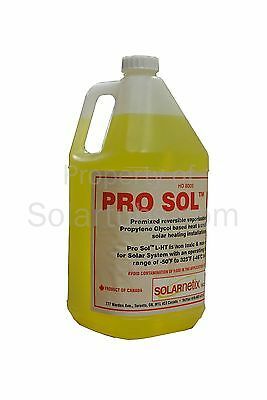 Pre-Mixed Pro Sol L-HT propylene glycol/water mix 50%/50%, contains a specially designed industrial package of liquid inhibitors. The Glycol Mix has been designed especially for use as a heat transfer fluid in solar thermal systems operating under elevated thermal conditions (vacuum tube collectors). In case of stagnation those components evaporate together with propylene glycol and water, the collector remains empty, and no damaging insoluble residues that may cause any flow obstruction or blocking. The corrosion inhibitors contained in ProSol L-HT reliably provide protection against acid corrosion, scale and sedimentation formation in systems with materials normally used in solar thermal installations. We feel that being honest is a much better policy to win your trust rather than trying to lure you with nearly impossible statements such as life time warranty. Nothing lasts forever! Our warranty policy is simple; we offer a 3 year warranty on everything we sell and 10 years on our collectors. With this warranty you will get NO hassle next business day replacement (if shipping service and inventory permits). However, as a valued customer you will get technical support through the lifetime ownership of your product. Our Collector do carry longer warranties 10 years from the manufacture. The warranty cover failures that occur during normal operational conditions or manufactures defects. It does not cover failure due to inappropriate operation such as freezing or over heat. Damage caused by vandalism, storms, floods etc. Your houshold insurance should be modified to cover the system from such situations.